My mom and my sister are both avid quilters. And, by avid, I mean, avid. Into-it… taking trips for quilt festivals to places like Sisters, Oregon, to see the latest quilt patterns, taking a weekend of classes, and each have an entire CLOSET of neatly organized clear bins filled with quilters fabric, arranged by color, in a dedicated ROOM with their specially designed sewing machine, quilters table, and even a task light with some sort of super power. So, you get the point, they are quilters. And, I must say, their quilts are a.maz.ing! Works of art. Maybe someday I’ll post some photographs of them. But that’s another blog post. 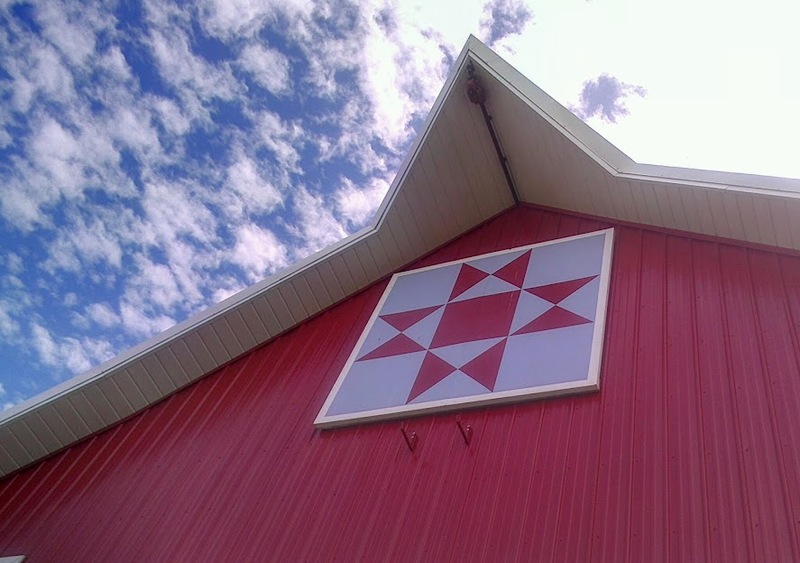 So, Mom loves quilts, loves to quilt, and hey, she knows where to find a barn! Voila! Mom decided that the Mader barn needed its own barn quilt. She went to work doing research to pick just the right quilt pattern that would mean something to her and the family and one that would look like a million bucks on the barn. Mom’s roots lead back to the Kennoyer name, Jeremiah Kennoyer, who lived in the Ohio region. It is one branch of Mom’s family that she feels particular connected to, so she happily settled on the Ohio Star pattern. Next she carefully selected the paint colors to use in her quilt that would honor the pattern and look spectacular on the barn, too! Is anyone curious? The rest of the story involves a Norman Rockwell vision of an old fashioned soda fountain, too. Shall I continue, or should I just show you the rest of the pictures I took of the barn and move on? I would like to hear your thoughts! I’m Cheryl, wife of Taun Allman, who painted the barn quilt for Dan and Cindi. Dorothy asked me to send you the business card image that I created for Taun for painting barn quilts. I’ll try to send it here. If that doesn’t work, could you email me at the address below and I’ll send it to you in email. I’ve enjoyed reading your blogs that Dorothy has shared with me. Great voice! P.S. Ok, I can’t figure out how to send the image here. I’ll email it to you when I hear from you. Thanks! I’d love to hear the rest about the barn quilt. 🙂 And I remember the story about the knife block. Think I might have still been living in AZ at the time. I have got to get the second installment ready to go – probably this next weekend! I miss you being here!!! Really enjoyed reading your blog about the barn quilt and rain boots. You have a talent for story telling! Keep up the great work. Hilarious! Give us more about barn quilts. Very cool beginning. Lots more to share about this. Consider an update on the idea for a geocache to see barn quilt. I will send pics.